This is a webpage devoted for system developers. If you are interested in the whole system (Cell+Sheath+Controls) please check our Half Mini web page. The advantages of cylindrical DMA cells for the classification of nanoparticles have been long acknowledged by the scientific community. When high performance (transmission, resolution) is desired, the DMAs need to operate at Reynolds numbers >>2000 (supercritical) requiring laminarizers and diffusers that have tended, during decades, to make them large and heavy. Recently, SEADM developed, in collaboration with Professor Juan Fernandez de la Mora, from Yale University, its renowned Half Mini DMA Cell, for high flow rate operation, offering miniaturized dimensions and a weight of only 2.7 kg. This first version of Half Mini Cell -termed (m) model- [Fernandez de la Mora, 2013], effectively worked at supercritical regime delivering unique resolving powers in excess of 30 (peak voltage/FWMH) at 1 nm, i.e., clearly higher than competing commercial solutions [Link]. Figure 1 shows the basic architecture as well as principle of functioning of the device. In a more recent development [Fernandez de la Mora, 2016], termed Half Mini (p) model, a series of fluid-dynamic developments were introduced to extend the achieved resolution of the Half Mini up to particle sizes of ≈30 nm and higher. 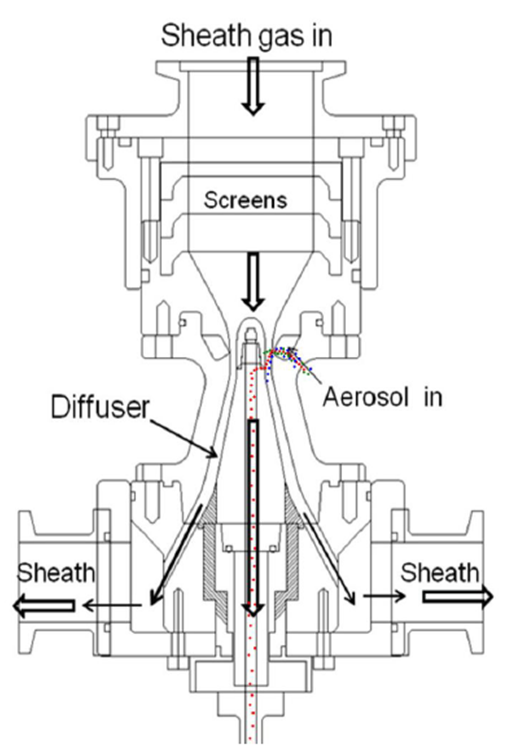 These developments, focused in the increase of axisymmetry of the flow in the area of the aerosol inlet, are summarized in Figure 2. Figure 3 shows an actual comparison between the Half Mini (m) and the Half Mini (p) models. The charge-reduced electrospray ovalbumin protein was used as test aerosol. For the (m) model, it is observed how the resolution departs form the ideal behaviour at q/Q>2%, being q and Q the sample and sheath flow rates (Fig. 3a). The Half Mini (p) model achieves ideal performance at a relatively low sheath flow rate (suitably therefore for larger particles) of 27 lpm, providing evidence for the effectiveness of the new improvements. Figure 2. New developments in the Half Mini (p) model: (1) modification of the geometry, both the upper and lower “lips” of the inlet slit to achieve a flow directly substantially downwards; (2) relatively large radius of curvature introduced in the lower lip to reduce jet separation and (3) perforated ring to further promote axisymmetry of the flow. From experimental evidence [Fernandez de la Mora, 2016], development (3) turned to be the most effective in the extension of the high resolution range. You can now benefit from the best performance cylindrical DMA technology currently available. Either (m) or (p) outperform its competing solutions [Link]. Both (m) and (p) cells are available from SEADM, especially suited for system developers. 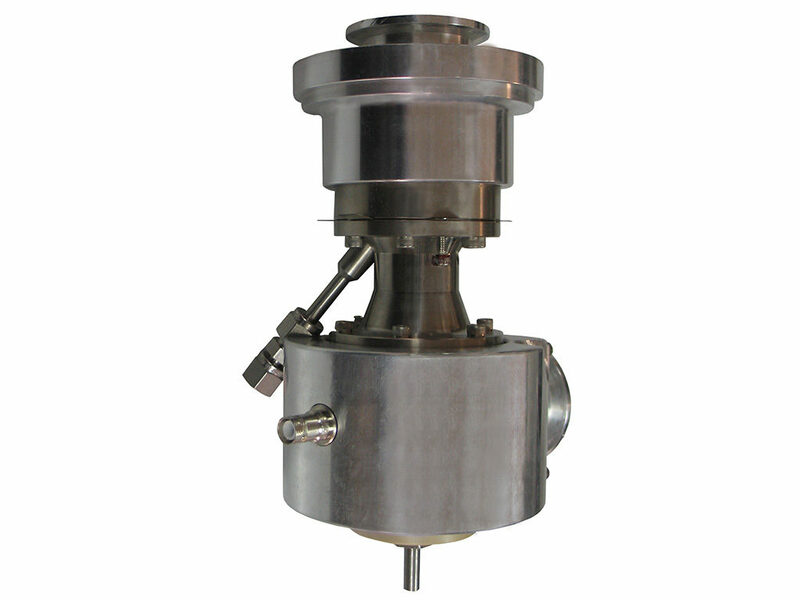 Otherwise, we can supply the complete system including the sheath recirculation loop, ionization unit and controls. Do you have questions? Just contact us; our engineering team will be very pleased to help. submitted to Journal of Aerosol Science (Dec-2016).